Several courses of the bachelor’s programs Medicine and Biomedical Sciences are taught in English and we have places available for international students. LUMC also offers electives (half minors) in English. Each elective course of ten weeks covers a specific (bio)medical theme and has strong links with cutting-edge research within LUMC. 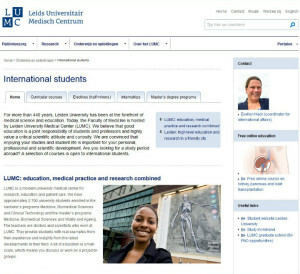 In addition, two master’s degree programs at LUMC are in English. Vitality and Ageing offers a unique holistic approach on ageing, and Biomedical Sciences prepares you for a career in biomedical research. It is also possible to do a master level research internship (for both Medicine and Biomedical Sciences) at one of our research departments.